Thursday, June 22, six World Class corps opened the Drum Corps International Tour at Lucas Oil Stadium in Indianapolis, the same venue that in seven weeks will bring an end to the 2017 season. The DCI Tour Premiere presented by DeMoulin Bros. and Co. saw the season begin as it did last year, with Bluecoats ahead of Carolina Crown. But this year, Bluecoats opened up a wide spread, 1.35 ahead of Crown, whereas last year, the difference between the two corps was only 0.50. 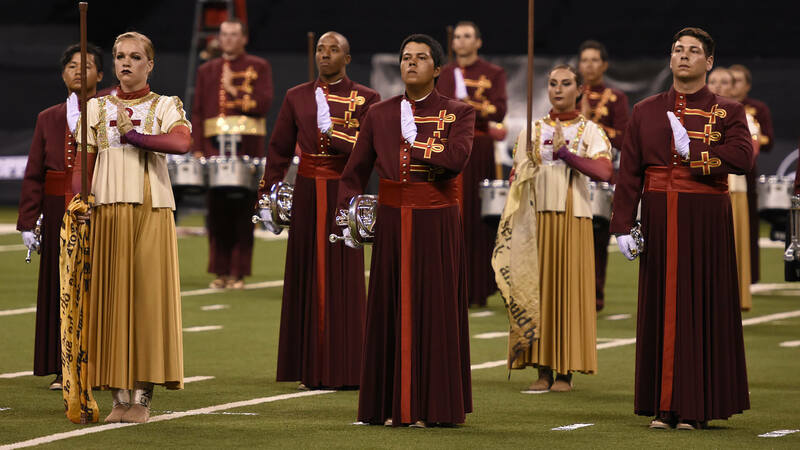 In third place, The Cavaliers finished 0.80 down from Crown and 1.85 above The Cadets. Last year at the same season-opening show, Cavaliers finished 1.55 under Cadets and 3.80 under Crown. Cavaliers' 2.15 deficit to Bluecoats this year is exactly half the 4.30 deficit the corps sustained to the 2016 World Champions at last year's DCI Tour Premiere. The fifth- and sixth-place corps were Blue Stars and Crossmen, two corps who weren't at this particular show last year. In reading the following, please keep in mind that the scores of the two effect captions are counted for full value, without being averaged. However, each of the scores of the three visual and three music captions are first divided in half, with each of those half scores added for the total visual and total music scores. At this point of the season, there is only one percussion judge, for a total of eight judges. About mid-season, we'll see an additional percussion judge added to the mix, and toward the end of the season, the general effect panels will be doubled. For now, there is one judge for general effect 1 and one for general effect 2. Each judge is responsible for adjudicating the complete show. The three visual captions that are divided in half and added together are proficiency, analysis, and color guard. The three music captions that are divided in half and added together are brass, analysis, and percussion. VIew the complete scoring recap for this event. Bluecoats (1st - 72.300) won both General Effect captions by a combined 0.90 over Crown and Cavaliers (who tied Crown in Total Effect), accounting for exactly two-thirds of the corps' 1.35 advantage over the 2nd place corps. Bluecoats also won Visual Analysis, Color Guard, and Music Analysis. The corps placed 2nd to Crown in Visual Proficiency and Brass and second to Cavaliers in Percussion; but when the three Visual and three Music scores were combined, Bluecoats won Total Visual by 0.30 and Total Music by 0.15. Outside of Effect, the two biggest spreads over Crown were 0.50 in Visual Analysis and 0.40 in Percussion. Carolina Crown (2nd - 70.950) won Visual Proficiency and Brass, each by 0.20 over Bluecoats. However, the corps tied Cavaliers for 2nd in Total General Effect, took 2nd in Color Guard and Music Analysis, 3rd in Visual Analysis, and 4th in Percussion, placing under Blue Stars' line by 0.20. Still, the combined Music score was only 0.15 under Bluecoats and 0.45 over Cavaliers. The Cavaliers (3rd - 70.150) tied Crown for 2nd in Total Effect, placing 2nd in General Effect 2. The corps also placed 2nd in Visual Analysis, 0.20 under Bluecoats and 0.30 over Crown. Music Analysis placed 3rd, 0.40 under Crown and the same distance above Cadets. The corps also placed 3rd in Visual Proficiency and Music Analysis. Cavaliers placed 4th in Color Guard and Brass, slipping under Cadets in both captions. The Cadets (4th - 68.30) took 3rd in Color Guard and Brass, and 4th in both General Effect captions, Visual Proficiency, Visual Analysis, and Music Analysis. The low point for the corps was 5th in Percussion, finishing 0.7 under Cavaliers' line and also placing under the lines of Bluecoats, Blue Stars, and Crown. Although the corps placed 3rd in Brass, the line finished 0.90 under Crown's line, the same spread the line scored above Crossmen's 5th place line. Blue Stars (5th - 64.15) took 3rd in Percussion, beating all but the Cavaliers and Bluecoats. Total General Effect, Color Guard, and Music Analysis placed 5th, and Visual Proficiency, Visual Analysis, and Brass finished 6th. The Blue Stars' Brass score was a full 1.10 under the corps' Percussion score. Crossmen (6th - 63.80) took 5th in Visual Proficiency, Visual Analysis, and Brass, and 6th in the remaining captions.